From iOlé Gourmet we want to present you the best selection of Spanish Cheeses, where you will find the finest products that makes you enjoy your consumption. Located in Northern Spain, in The Principality of Asturias nature is found to be the best ally the cheese industry has. 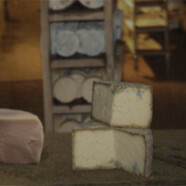 The natural caves provide constant humidity and temperature, to livestock farming, focused on cows, goats and sheep fed by the Asturian farms and mountains, has made it possible to obtain a great variety cheeses using a single type of milk or mixtures of the different types with maximum quality. The fine Cheeses of Spain express unmistakably the characteristics of their origins… the milks, the grazing lands, the climate, the method of production… even the microbiology of the region. Their unique qualities are protected by each Denomination of Origin, symbols of which certifies the authenticity of each variety. The yellowish Manchego, sharp rich Ibérico, smokey Idiazábal, savory of the Tortas.